New Delhi: Iron ore exports from Goa have slowed further in recent months following a probe into illegal mining in the state, which local miners say has tarred their reputations in global markets. “All the signals going out to customers is doing a lot of harm," P.K. Mukherjee, managing director of Sesa Goa Ltd, said at a press briefing on Monday. “Suppliers get a reason for blame so there is definitely a serious issue for the long term." According to Mukherjee, also the president of the Federation of Indian Mineral Industries, or Fimi, India’s iron ore export in 2011-12 is set to fall to 65-70 million tonnes (mt) from about 100 mt a year ago. Goa shipped 19.76 mt of iron ore between April and October, down 6.15% from a year ago, Fimi’s data show. In 2010-11, Goan ports routed about 54 mt of India’s total export of about 95 mt. Most of its iron ore fines landed in China, which houses the world’s largest steel industry. Mukherjee said the pace of mining in Goa has not dropped much and the state’s output is likely to be about 47 mt. The Goan miners at the briefing conceded illegalities in mining did occur, with about 7-10 mt of the fines coming from unknown origins. Fly-by-night operators drawn by the surge in demand in the past few years did not pay attention to mining rules, they said. “In majority of the cases, we don’t fall under any of the violations seen in Karnataka," said Ambar Timblo, managing director of Fomento Resources. “There is a need to make sure (that) because of one violater everyone doesn’t get painted by the same brush." The miners are awaiting the Justice M.B. Shah Commission’s report on illegal mining in the state. 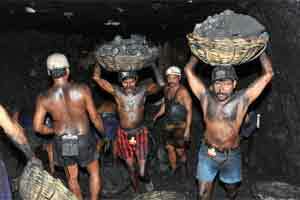 About 75,000 people are involved in mining in about 90 mines in the state. The industry earns about ₹ 17,000 crore from exports and contributes about ₹ 6,000 crore of direct revenue to the state and the centre. “We have been collecting statistics from ports and supplying it to the government on a concurrent basis," said Shivanand V. Salgaocar, managing director of V.M. Salgaocar and Brother Pvt. Ltd and president of the Goa Mineral Ore Exporters’ Association.